Ilulissat Highway of Glistening Icebergs! Glittering Icebergs Move in Ilulissat! Ilulissat Ice Inlet is a massive wall of icebergs, which stretches 60 kilometres from the town of Ilulissat to the ice cap of Greenland. This is one of the most beautiful and impressive places in the world. It is said that by observing the Arctic you can see what will happen to the rest of the planet. The following lines are about this topic. However, if you have been in the area or if you know more about it, please use the form at the bottom of the page to publish it here. The Ice inlet breaks off from the (Jakobshavn Glacier) and the tongue of the glacier has retreated by 7 kilometres since 1992. It is the fast moving glacier in the world. What happens there considered the largest sudden changes. The Ice inlet runs 40 kilometres to the west from Greenland ice sheet to Disko Bay near Ilulissat town. Iceberg breaking from the glacier is often so large up to 3,300 ft in height. The glacier is a part of the Greenland ice sheet, which covers more than 80% of the island and is three kilometres deep at its thickest point. This is one of the fastest places on Earth where global warming will happen soon. According to a research issued in 2007, warm air temperatures and ocean currents melted over 240 cubic kilometres of ice into the sea. That is 97% more than the average annual melting between 1995 and 2006. While the climate changes dramatically, people's lives change as well. Since the permanent winter ice in Ilulissat ice inlet now disappeared, the population can no longer use their sled dogs to hunt seals. The storms threaten the way the people live, their houses and the traditional travel routes become dangerous. The polar bear has moved horizontally further north, and the narwhal are not so many anymore. With the sea ice melting and snow cover diminishing, rays from the sun are absorbed into the sea and earth instead of being reflected back into the atmosphere. This exacerbates global warming, causing the ice to melt faster. It is as if the world is ensconced in a self-heating electric blanket. The melting of the inland ice contributes to the rise of sea levels, causing salt-water intrusion and flooding of coastal areas around the world. Were the whole of the Greenland ice to melt, the oceans would rise by 72 metres. The Arctic Ocean Conference held in Ilulissat town in 27-29 May 2008 and attended by Canada, Norway, United State, Russia and Denmark where representatives of those countries discussed issues related to the Arctic Ocean and climate change. The meeting concluded with the issuing of the Ilulissat Declaration. 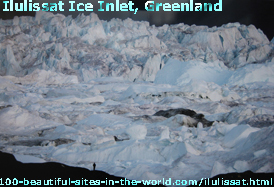 If you found this page about Ilulissat Ice Inlet, Greenland interesting, please do share it with your services through the following buttons. If you have no services there, why not register some and enjoy the pleasures of the technologies of those social networks.